This is my professional outfit with a twist. I like wearing sophisticated and classic clothes with a little added flair such as: hot pink lips (my signature color), a leopard belt and an unexpected hat. Loose the hat and you're ready for the office. I'm so obsessed with my new mustard pants that I wore them despite the summer heat! so cute! you look very chic! I just love the color of those pants! great outfit, and those mustard trousers are brilliant! hot pants! im a mustard girl myself, i really love the deep yellow hue on blondes. love this entire look! Love the details, like the leopard belt! These mustard pants are great, I love classic cuts mixed up with an interesting colour or pattern. Love this outfit and all the colors those pants come it, great pop with leopard print belt!! Love this, these trousers are amazing. Mustard is my fave at the moment. This is such a great look on Taylor! I love those yellow pants! They really brighten everything up! I love this. It's tough to put together a look professional enough for the office and still manage to keep it fun and bold. Officewear can be so boring. Thanks for the inspiration! Those mustard hued pants are ultra chic! And paired with the feline print belt makes it even cuter. Also I have included some of your style inspiration in my latest post. Gorgeous! I love the mustard pants! Especially with that leopard print belt. Great color, I wish I could pull it off! I love mustard color. Those pants are great. Go J. Crew. im dying over the color of those pants. have you seen j.crews newest catalogue. i was in love... so many amazing colors! Love the simplicity of this outfit. So easy chic..and the leopard touch is perfect! Totally love the color of those pants. Gorgeous pants I love love love the color. You look amazing. They are so chic indeed! And they fit you perfectly, making it all the more professional looking. There's something about mustard and leopard that seem to get along perfectly, so well put together! I absolutely adore everything that J Crew make! I have pants of a similar style and colour from them and they are just perfect for summer! You did a fabulous job with the warmer toned and also neutral accessories. You're a knock out! I love mustard too! this look is really what ım looking for these days. I found similiar pant and belt in Massimo Dutti and will be the first thing to try it. I just posted about the mustard trend a few days ago! Love how you wear those pants with a leopard print belt! Great! So need those pants, they look fabulous on you!! Those pants look fantastic on you! What a great color! I adore those yellow trousers!!!! cest fantastique! So chic professional - I heart your mustard pants. Classic, chic, pretty outfit! Love the pants and I think I need some from Fall. These pants are amazing! I work in an office and feel like I dress very boring. These would be the perfect twist...but I would stand out like a sore thumb! love this shade of yellow with black accessories. cute! This is so fresh and chic! Ok, everyone's colored J. Crew pants are totally tempting me! I need them in my closet stat! start to loving this mustard color! so chic and clean and fresh! You look lovely and so classic! Taylor, you look ADORABLE! I love those bright pants. love your outfit! always love your outfit! Looking gorgeous! Love oyur pants! Super cute! Love it with the leopard and gold. love the little details here! buckled leopard belt, pop of colour, and the shoes look great too! Oh... I'm falling in love with those pants too. Mustard goes with practically everything! And I love the leopard print belt too. Perfect detail. This is so beautiful! The pants are amazing! Those pants - amazing! I tried to get them in the pink color but they were sold out! You look beautiful. Stunning! I love the fierce color of yellow. It looks awesome. I also like the entire outfit that you have. It so fabulous. you look so adorable in those amazing yellow pants, the perfect length beachy hair + hat, and sheerish shirt! love the touch of pink on your lips :) mustard colored pants look great on you! I love this! I would wear this outfit to work tomorrow if I could. The hat is so adorable and the rest of your accessories are perfect. I think this is a perfect transition outfit for hopefully the soon to come Autumn weather! I love your take on the classic black pants and white shirt combination. Mustard pants are adorable. I love that you added hot pink to your lips~ FAB!! gorgeous!!! i absolutely love this... the hat, the pants, the backddrop... perfection. Fabulous pants! I love the belt with them. very nice outfit. the the fit and color of the pants! Those pants are absolutely perfect on you! I LOVE them! 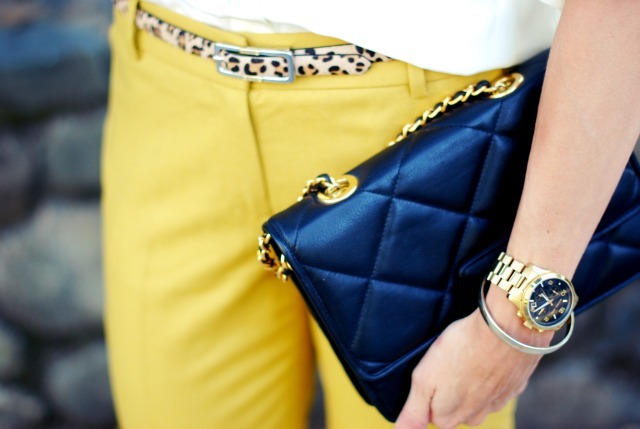 The mustard looks so good with the leopard belt! I love your pumps in this post. I've been looking for a pair like this for over a year and thanks for always noting where your finds come from. The day I saw your post I bought the pumps and they're on their way to my house. I can't wait. Thanks again and I love your blog! You're always chic! Your mustard pants are so NOW. I really want a pair. I love your professional outfit with a twist. I just discovered your blog and I find it very uplifting.